Doctor Who: Missing, Believed Wiped - THE POWER OF THE DALEKS | Warped Factor - Words in the Key of Geek. 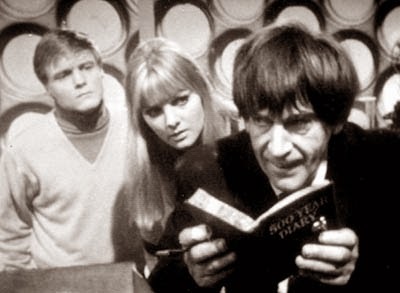 On November 5th 1966 the Second Doctor's debut story premiered. 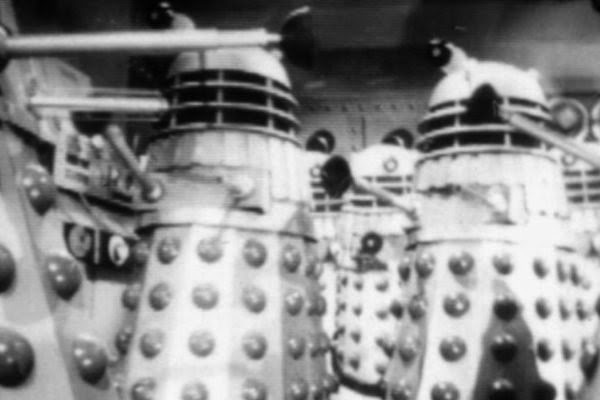 Forty nine years later Christopher Morley still feels The Power Of The Daleks. Despite the best efforts of search & rescue teams there remain some massive gaps in the BBC's 'classic series Doctors' portfolio. This might just be the biggest of the lot - thanks not only to the raspy robotic presence of the Daleks, but the début of a new Doctor! You may recall that the First Doctor's body wears a bit thin at the end of The Tenth Planet - well, now it's a case of 'The Doctor is dead- long live the Doctor!'. It's time for the Second to spring up & usher in a new dawn. Where once there had been a grumpy oldish young man at the helm of the TARDIS, the replacement he'd later so witheringly describe as a clown (& perhaps the Doctor's Doctor, with Patrick Troughton's portrayal lauded as a favourite by subsequent actors/incarnations Peter Davison, Colin Baker, Sylvester McCoy & Matt Smith) brought something so radically different it was crazy enough to work! 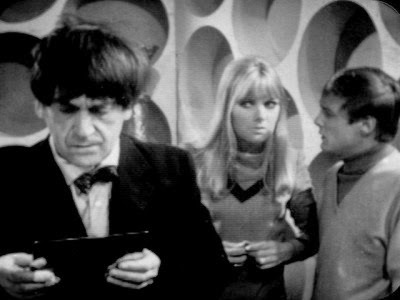 Understandably perhaps, companions Ben Jackson & Polly Wright are a bit shocked - the Gallifreyan grandpa they knew is no more - in his place seems to be a sort of McCartneyish tramp. This being late 1966, they quite logically surmise that he should be in the studio with John, George & Ringo getting ready to make the album that would become Sgt. Pepper’s Lonely Hearts Club Band. Did he drunkenly stumble back from a party to celebrate Revolver's success a few months ago and wander into the TARDIS? It certainly looks like he's got the mother of all hangovers in any case. Before they can get him a nice bacon sandwich to aid in his recovery, though, he comes to, laughing that 'it's all over'. The First's signet ring, perhaps the earliest incarnation's only bit of 'bling', quickly falls off the new man's finger - an early sign of change, by the look of things. New fingers, that's weird..not that it matters, as they don't stop the man they'll come to know as the Second Doctor having a rummage through his earlier self's things. Shoving a mirror into Ben's hands, he's about to inspect his new face when his old one appears to him - trippy, 'That's the last time I touch the herbal cigarettes!' he probably quickly swears to himself. Finding a dagger (remember Saladin from The Crusade?) and resisting the urge to quote a bit of Shakespeare safe in the knowledge that yes, it is actually a dagger he sees before him, Ben's still a bit suspicious...why is the new Doctor talking about himself in the third person? Isn't that a bit pretentious? First things first - yes, it is. Secondly (pardon the pun)- this new chap can't be who he says he is! There's treachery afoot, surely! Finding a scrap of metal in his jacket, the object of his suspicion utters the first proof that he actually might be a 'renewed' Doctor. ' Exterminate...' he burbles to himself. He knows about the Daleks, then. Good. That's a big fat tick in the 'yes, I am the Doctor' box. Having another look through his things he finds his Five Hundred Year Diary, resisting the urge to flick through it to check any missed dental appointments etc. Regeneration can be a funny business, you see. He also chances across a recorder - which he can indeed play & might come in handy later. 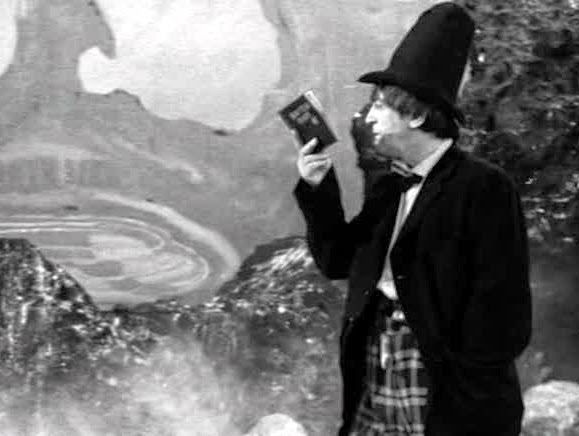 Suggesting they take a walk around wherever it is they've landed (the planet Vulcan, since you ask) he takes a leisurely look through his diary, having picked out a dapper stovepipe hat for the outing- might have to rearrange a couple of things for last week, the Doctor concludes. That's the only trouble with time travel...having somehow managed to weave his way through the planet's mercury pools without even a cursory glance up from planning his next 500 years, possibly including scheduled dates with a Professor River Song, he hits upon the idea of testing out the athleticism of his new body by leaping a large rock. His body itself may not thank him, possibly preferring the idea of a nice game of cricket to break it in gently. Maybe even a kick-about with Ben, at a push. The man shouting 'Help!' from the other side, though, must be glad he opted for a spot of high-jumping. Bit too late to stop himself from meeting a quick death, as a mysterious assassin is able to creep into play unseen & take him to a meeting with his maker. 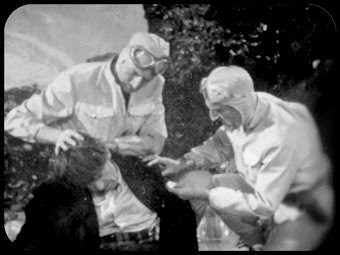 Our new McCartneyite hero is almost dead before he has the chance to really live, as the killer's next target - but is merely knocked out, not before pulling a button off his assailant's clobber. Just where are Ben & Polly? On the floor by the mercury pools (not like that, stop sniggering at the back), having had a whiff of the fumes. So, not much help at all. Rather luckily, though, rescue arrives in the form of Deputy Governor Quinn & Bragen, Head Of Security. Before our Beatle-barnetted buddy has chance to worry about the possible implications of a 'name not on the list, you're not coming in' policy, the two mistake him for the poor (and a bit dead) Examiner, the chap the Doctor just failed to save earlier. Realising he's got the chance to make good on his Drama degree from the Academy back on Gallifrey, he plays along. All he has to do now is agree to have a poke around a crashed 'space capsule'. Nothing too taxing. Surely all can't be as it seems, though? Hold on to that thought for a while - we'll be coming back to it. Actually, something is a bit wrong. Lesterson, the chief scientist of the Vulcan colony, has been doing some experimenting, collaborating with a trio of Daleks he found inside said capsule. They want power (of the electrical variety, for now) & he's helping them get it. Ben then quickly gets proof that the man he might've thought was one-fourth of the Fab Four is actually the Doctor after all when one of the metal menaces, reactivated by Lesterson, recognises him. 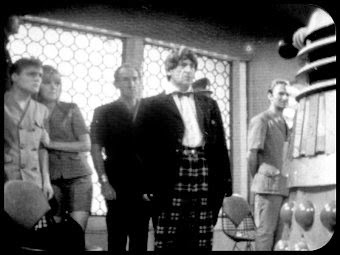 The boffin, though, thinks nothing of it, instead parading his new Dalek friend in front of everyone & reveling in the fact it obeys orders. 'I AM YOUR SERVANT!' seems to be its stock line of speech. A clever ploy, one that will be dusted off, sort of, by its ancestors in Victory Of The Daleks- 'soldier' of course replacing 'servant' when they attempt to convince Winston Churchill they're committed to seeing off the Nazi menace despite the Eleventh Doctor's scepticism. Before countless offers of tea, though, his present incarnation has to get to the business of persuading the colonists to destroy it. 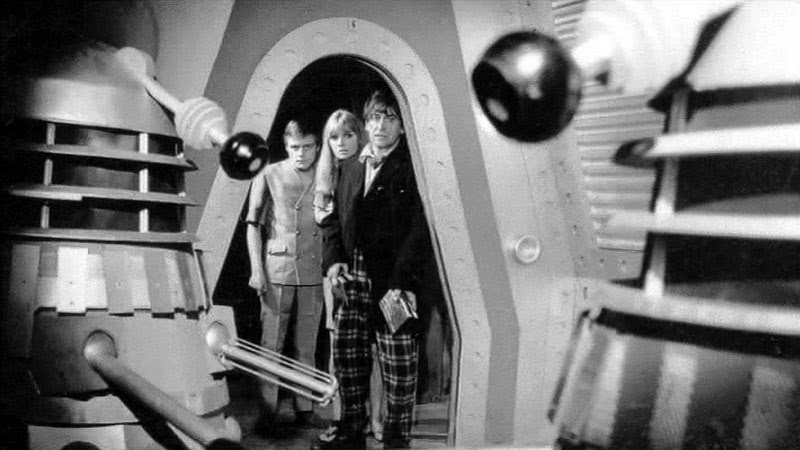 Being a scientist, though, Lesterson manages to convince the Governor of the place that he can use the Daleks to help the colony & indeed Earth as a whole. 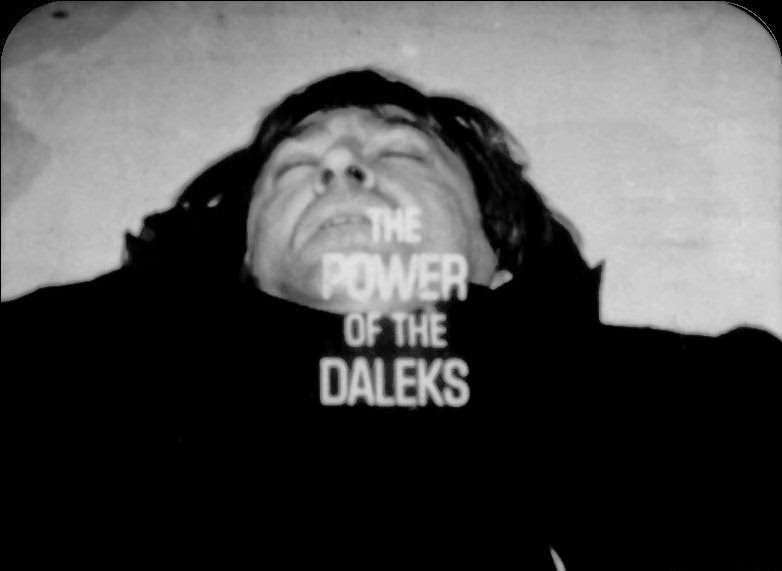 The Doctor, instead of shouting & swearing as he'd be more than entitled to do in such situations, restricts himself to a muttered through clenched teeth vow that he will indeed stop the wheeliebins with dictatorial ambitions. Not 'even if it kills him', though. That's a bit unfair, & he's still got everything from The Highlanders to The War Games to go in his personal timeline. 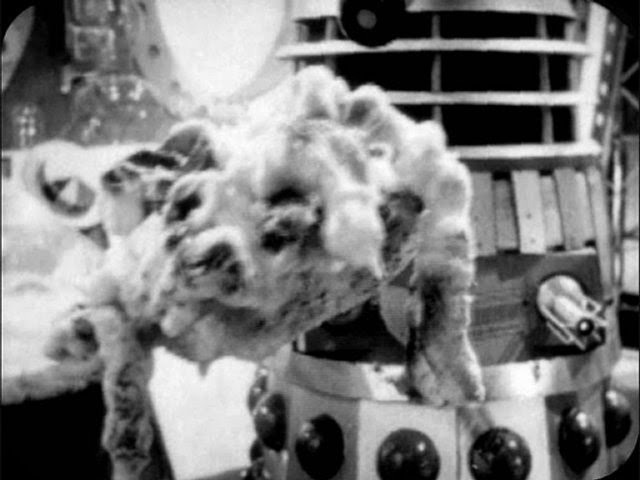 He does at least manage to get the Dalek to prove how good a servant it is by ordering it to immobilise itself. It does, probably with a murmured 'git' or something stronger under its breath, waiting till he's gone to wake up once more & tell anyone who'll listen that it obeys Lesterson. Political intrigue follows, with Bragen promoted to Deputy Governor & Quinn imprisoned. 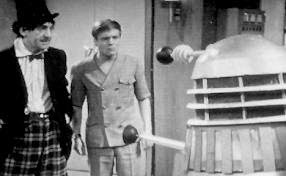 The Doctor, meanwhile, quite rightly decides to observe his old foes at close quarters, & asks to sit in on Lesterson's experiments. The boff is thrilled to discover his pal knows the answers to some mind-bogglingly complex science questions. Coming prepared with a control device he's knocked up earlier, the Time Lord is able to make it 2-0 on the Dalek-disabling front when he uses his new toy, attached to a generator, to knock another of them out. It's quickly found and made mincemeat of, but the handily-rigged bit of kit does at least render the affected 'travel machine' (remember Genesis Of The Daleks?) useless - it's unable to find the energy even to raise its gunstalk as the enraged Lesterson shoves him out of the lab. 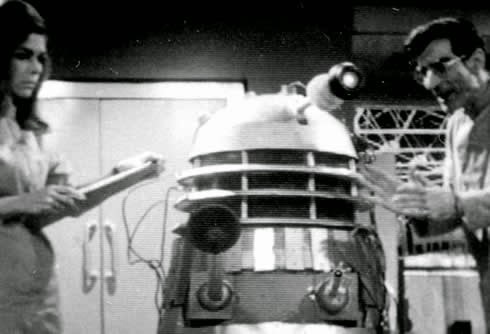 Once it's powered up again it manages to appeal to a certain curiosity on the part of the science whizz, who's now most likely under the thumb, if indeed Daleks can be said to have one.